Landscape Tool is used to create rectangular sized terrain areas according to provided data sources, but it cannot be used to create a whole planet. This tool helps to create up to 10000km x 10000km areas of the real world: it's enough to create a terrain of a big city or a country. Ordinary raster images to create an arbitrary terrain according to your own preferences. Geo-referenced ones (GIS data) to create a fragment of Earth's surface. Geo-referenced imagery and elevation data are processed by using the GDAL - Geospatial Data Abstraction Library. 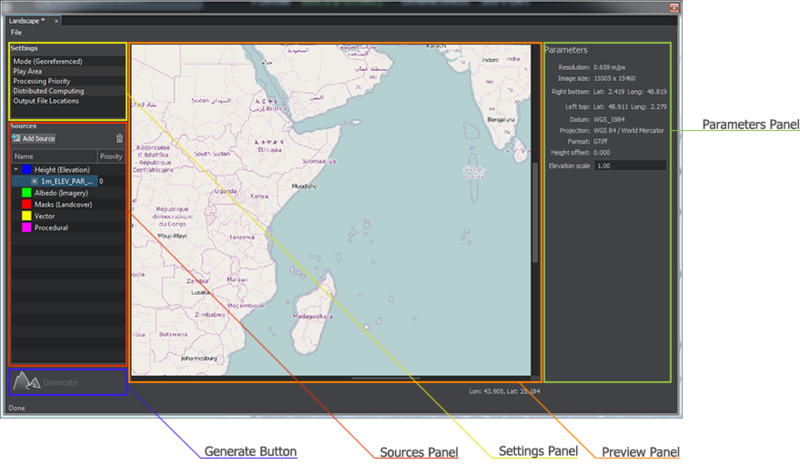 It supports various raster formats with different map projections for input data. RGB and RGBA formats for albedo (imagery) data. Alpha-channel in the second case is used to mark no data areas. R format for height maps (elevation sources). R and RGBA formats for masks (landcover sources). Bitness of the input formats can be 8, 16, or 32f. On the basis of landcover data, Landscape Tool allows generating masks, that can be used for details and vegetation. On the basis of vector data, procedural placement of objects is done. These data sources usually contain a lot of information that can be tagged and filtered using attribute filters. If the sources with no geodata are used, only details and vegetation can be generated. Generate grass for areas marked with certain colors of the landcover texture. Generate only highways ignoring small roads using a road type attribute in a vector data file. Generate buildings of a certain type only (e.g., apartments, garages, single- or multi-storey buildings, depending on the data stored in the vector data source). You can use QGIS, Global Mapper or other third-party software to determine which colors or attribute values from a GIS data source are to be used. 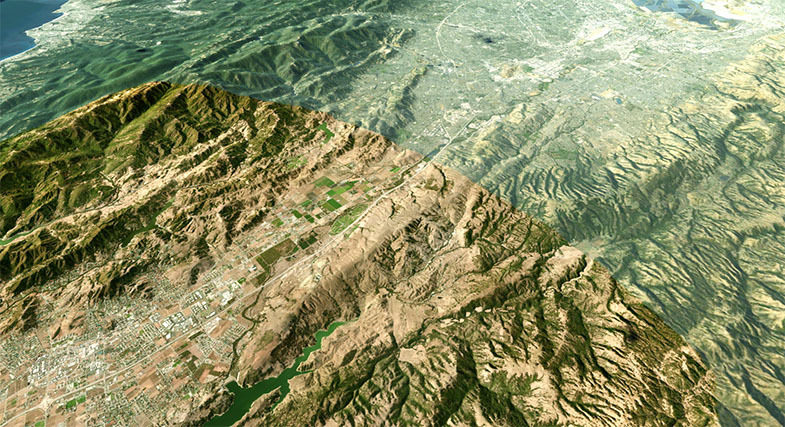 Landscape Tool supports multiple data layers aligned by geo or raster coordinates: you can easily create high-resolution insets by adding a high-detailed landscape area over a low-detailed one. This can be useful for flight simulators, where high details are required only for areas around airports. The quality of generated terrain is determined by the density of the data sources used. The Landscape tool has 4 panels (Settings, Sources, Preview and Parameters panels) and the Generate button. In the Sources panel, you should specify the height (elevation) and albedo (imagery) sources for the terrain generation, as well as masks (landcover), vector and procedural data sources for generation of details, vegetation, roads, communications, buildings, etc. if necessary. Selecting the Height (Elevation) or Albedo (Imagery) group provides access to Terrain LODs of this type of the data source. Selecting the Masks (Landcover) group provides access to Terrain LODs of this data source type, as well as to Detail Masks and Vegetation settings. Selecting the Vector group provides access to settings for cultural features of the landscape such as roads and communications, fences, pipes, etc. Settings panel contains a bunch of generation settings: Mode, Play Area, Processing Priority, Distributed Computing and Output File Locations. In the Preview panel, you can specify the play area of the landscape generation. In the georeferenced mode, the preview panel depicts the world map in the equirectangular projection. Parameters panel depicts parameters of the selected settings or information of the selected data source. The video tutorial on Georeferenced Terrain Generation. The video tutorial on Arbitrary Terrain Generation. The documentation on the GDAL library. The Wikipedia article on Equirectangular projection.